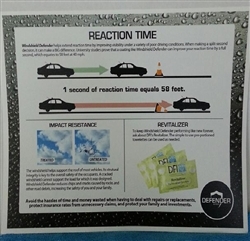 A laminated demonstration card you can use to effectively show the benefits of Windshield Defender™. An approximately 8.5" x 11" double-sided sheet with visual aids on both sides. A great tool to have in your repertoire.